Sloths are Adorable, and so is your baby! Sloths are adorable, there’s no debate, just like there’s no debate about how cute babies are too, especially your baby! So, whether it’s your baby’s birthday, announcing the arrival of your bundle of joy, or throwing a baby shower, our Cute Sloth design is the perfect way to celebrate. 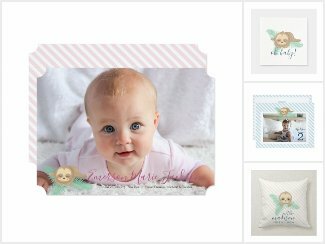 We’ve got customizable invitations, stickers, paper napkins, paper plates, and photo cards for the celebration as well as cute items like personalized lamps, pillow for baby’s birth stats, blankets, and more for the nursery. Check out our complete Baby Sloth Collection below. *All Sparkle & Glitter designs are available on a wide variety of products but are only featured above on a select few. If you need a design on a not-listed product or looking for a different color option, don’t hesitate to contact us to assist.